Words by Jeff Salisbury. Images by Rev. Christine Plepys. This past November myself and (to blatantly steal a turn of phrase from Mike) my Sweet Partner in Travel (SPIT), Christine, took a trip to Southern Africa that included a safari in Botswana, a day at Victoria Falls in Zambia, and about a week in South Africa near Cape Town and in the wine country of the Robertson Valley. [MJR note: some amazing photos can be found here.] While we were able to have wine with our meals throughout the trip, this report will focus on the wines we had in the Robertson Valley, with two notable exceptions. 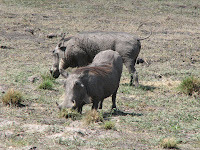 First, when we initially got to Botswana we stayed one night in Audi Camp, a base camp before starting our safari. The camp had an outdoor restaurant and the SPIT had a glass of the house wine, which was listed on the menu as–I am not making this up–Chateau de Cardboard. Upon further inquiry we were informed that it was whatever box wine they had on hand. We didn’t find out what it really was, but the SPIT said she liked it. I took a sip and thought I tasted the hint of vinegar making me think maybe it was time to change the box. But at R15 (South African Rand) per glass (a little over $2) the price was right. Second, in Cape Town we had dinner one night at a restaurant called Arnold’s. Arnold’s is a nice, somewhat upscale restaurant with a menu typical of such places, except for a number of wild game items like Okapi sirloin and crocodile ribs. 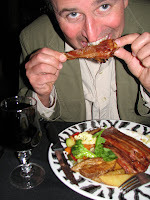 I thought about getting the Okapi, but the SPIT said I should get something that we had actually seen on safari (SPIT is a little warped in that way) so I had the Smoked Wild Warthog Ribs. The ribs were basted in a tomato sauce, and they tasted very much like regular pork ribs but leaner and not quite as tender, with a flavor that was less gamey than I expected. Having never had warthog before, I asked the server for a wine recommendation. He suggested the 2003 Altydgedacht Dry Red, a blend from Durbanville, South Africa. It retails at around R140 or about $18 per bottle at current exchange rates. As the name indicates the wine was dry with good fruit and very well balanced. The SPIT and I both liked it enough to order a second glass. It was very good by itself, but I thought it was much better paired with food and was a really good complement to the warthog. I would not call the SPIT and I overly sophisticated wine drinkers (more like students of TNV), but we know what we like and we actually liked all of the wines we tried in South Africa, some more than others. Our first winery stop was at the Viljoensdrift Winery where we sampled five different wines. Life for The Naked Vine foreign correspondent is arduous and fraught with peril – or not. 2009 Colombar Chenin Blanc (R24 or $4 per bottle). You are not reading that wrong. It was $4 a bottle. This is a 60% Colombar 40% Chenin Blanc blend. It had nice fruit up front with a little citrus flavor and some sweetness to it. 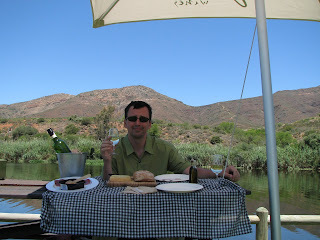 We both liked it enough to buy a bottle to have with a picnic on the winery grounds by the Breede River with some cheese, bread and ostrich carpaccio. 2008 Cape Blend (R39.50 or $5.50 per bottle). This wine is a blend of 34% Pinotage 66% Shiraz. According to the winery it has a good tannin structure allowing for excellent ageing potential and is good with venison. We thought it was very tasty, particularly the SPIT, who prefers her wines on the dry side. 2008 Chardonnay (R50 or $6.60 per bottle). This wine had good fruit with a hint of vanilla and oak. It was a very refreshing dry wine. 2007 Pinotage (R58 or $7.70 per bottle). Pinotage is what South Africa is known for, so we had to try this wine. It had a vibrant red color with a lot of berry flavors and a nice soft finish. Finally, we tried the Villion MCC Brut (R65 or $8.60 per bottle). This wine had tiny, delicate bubbles with a bready aroma. It had very good body and nice balance. Our next stop was at Springfield Estate Winery which had been recommended by the manager of the nature reserve where we had stayed the previous night. Once again all the wines were excellent, but a few stood out. 2009 Life from Stone Sauvignon Blanc (R67 or $9 per bottle). The vines for this wine are planted in very rocky soil. It is a somewhat austere wine with an almost flinty, grassy flavor. SPIT and I both loved this wine. It had a very clean flavor which we found out later pairs well with spicy and creamy foods. 2009 Special Cuvee Sauvignon Blanc (R66 or $9 per bottle). Unlike with the previous wine, these vines are grown in sandy, alluvial soil and the difference in the two wines clearly evident. It has a lighter and softer flavor than the Life from Stone. It was very different and very good. 2003 The Work of Time (R100 or $13 per bottle). This is a blend of merlot, cabernet franc and cabernet sauvignon. The grapes were fermented whole with native yeast and left for 5 weeks on the skins. A slow 18 months of barrel maturation followed and 2 years of bottles ageing it had a spicy, peppery flavor that would go well with spicy foods and cheeses. Finally we tried the Methode Ancienne Cabernet Sauvignon (R205 or $27 per bottle). This wine is a little out of the Vine price range, but well worth it. It is aged two years in new French barrels and a further three years in bottles in the winery cellar. It was dry with a lush, full flavor and a long finish. It was great when we tasted it at the winery, and with 5-6 more years in the cellar it will only get mellower and round out nicely. The next and final stop on our wine safari was at the Fraai Uitzicht Historic Wine & Guest Farm where we stayed for one night. Fraai Uitzicht is Dutch for beautiful view and it lived up to its name. For dinner at their restaurant we both indulged in the Degustation Menu – seven courses paired with wines from the Robertson Valley. We really enjoy paired dinners because someone who knows wine has done the work for us and made sure the selections complement the food. They are a great way to increase your wine knowledge. The first course appetizer was a selection of finger foods that presented a variety of flavors. It was paired with Methode Cap Classique Sparkling Wine from Graham Beck Wines (R125 or $17 per bottle). The wine was a blend of chardonnay and pinot noir with fine bubbles and went well with all of the foods in the course. The second course was a salmon trout fillet on a bed of wasabi leek. The pairing was Life from Stone Sauvignon Blanc from Springfield Estate Winery (see above). The wine was very crisp which helped offset some of the heat from the wasabi. The leeks were prepared in a creamy style and the wine actually helped cut through that, so that each bite was as tasty as the first. We thought this was the best pairing of the night. Next we were served a spicy butternut soup paired with gewürztraminer from Weltevrede Winery (R75 or $10 per bottle). The soup was delicious with only a slight spiciness (The SPIT, with Texas upbringing, said she couldn’t even taste any heat). The wine was a little sweet with a slight honey flavor which paired nicely with the soup. Then came the springbok carpaccio, thinly sliced and lightly smoked. This course was paired with the 2005 Fraai Uitzicht Merlot (R148 or $20 per bottle). Fraai Uitzicht only makes a small amount of wine (about 5,000-6,000 bottles per year)--all merlot. It’s very well crafted, easy drinking with a nice long finish with some plum flavors coming through. It held up well to the smokiness of the carpaccio. We liked it so much we bought a bottle to bring home. The next course was medallions of beef fillet in a port wine jus with tipsy onions (onions marinated in red wine) with spaetzle. The pairing was Red Gold Cabernet Sauvignon from Bushmanspad (R78 or $10.30 per bottle). The cab was lighter and fruitier than the merlot with some vanilla flavors peeking through, though food wise this was probably our least favorite course. Finally, we had dessert–Dream of Africa. This was a freshly baked fondant of Belgian chocolate served with vanilla yogurt cream and berry coullis. The word decadent does not do justice to this dish. It was paired with a Cape Muscat from Weltevrede (R105 or $14 per bottle). The wine was very sweet with a slight strawberry taste, which went well with the dessert. All in all we really enjoyed the wines we had in South Africa and highly recommend giving them a try. For the time being, though, the limiting factor with regards to the wines described in this article may be availability. The Graham Beck wines are widely available in the U.S. and the Springfield wines are available in a number of states along the Eastern seaboard. However, the only other wine we found for sale in the United States was the Weltevrede Cape Muscat while the rest are available only in South Africa or in European markets. So while they are certainly within The Naked Vine price range if you buy them in South Africa, factoring in the $1,000+ flight to get there might make them a little pricey. Wine Accessories -- Just in time for the holidays! We've spent a lot of time here looking at different bottles of wine, learning about them, enjoying them -- but we haven't talked much about opening them or what to do once that's done. Vine reader and neighbor Steve G. recently asked me for recommendations for wine accessories -- all of those little things that make drinking wine easier and better. Since I'm never one to turn down a potential column topic, I jumped on the idea like a hyperactive frog. Especially around this time of year, for last minute Christmas or Chanukah shopping -- wine related gifts can really help in a pinch. Now, I've looked at wine catalogs that have a lot of outlandish gizmos and gadgets for oenological use. Most of that stuff may be cool looking or fun to play with, but it tends to clutter the counter and make the Sweet Partner in Crime clear her throat insistently. You've also got cutesy things like wine charms (people forget which charms are theirs as easily as their glasses), silly wall signs, funny looking wine holders, and other kitschy things. However, I've got a few things that I've got that I use regularly and that greatly aid in my enjoyment of this little hobby of mine. I've also included some Amazon links to some of these products if you want to see what I'm referring to. First off -- think about the first thing you have to do when you're drinking wine: opening the bottle. Unless your entire cellar is full of Stelvin closures, you're going to need to find a way to get the cork out. Now, while there are techniques to do with no tools...it's usually best to use an opener of some kind. For absolute ease of use, I've yet to find anything that works better than the Screwpull Pocket Model Corkscrew . Until I became comfortable using the "waiter style" corkscrews, the Screwpull was an absolute godsend. It's still the best opener for delicate corks that I've found. It's almost impossible to break corks with it. It doesn't work quite as well on a few kinds of "squishier" synthetic corks, but for the most part, it'll serve you well. I actually prefer the "pocket model" to the "table model." It's also worth dropping a few dollars extra on the Screwpull Foil Cutter . If you prefer a waiter style one (which is what I normally use), make sure you get one with good, solid metal construction and perhaps a built-in foil cutter. If you're like me, you've bought a bottle of white wine, had it sitting on a rack (because leaving it for long periods of time in a regular fridge kills the flavor), and found an occasion to open it -- but it's still at room temperature. There are all sorts of more expensive ways to cool wine, but I always come back to the sleeve you keep in your freezer. Vacu Vin makes a very good, inexpensive wine chiller -- it's held me in good stead for years. Of course, if you want to splurge, you could get yourself a small, attractive wine fridge to keep in the corner to rotate your whites through. I can personally attest to the quality of the Cuisinart CWC-600 Private Reserve 6-Bottle Stainless-Steel Countertop Wine Cellar . Just remember -- this is a wine fridge...not a refrigerator. Set it for 50-55 degrees. Going all the way back to the start of the Vine, I've talked about the necessity of swirling wine to release the flavors and scents, as well as letting the process start by opening a wine a little while before you get to drinking to allow it to "breathe" and reach its fullest balance of flavor. Unfortunately, letting a wine breathe can take some time -- hours in the case of some reds, and I often want to drink right now! While nothing can really take the place of decanting and some time, you can shortcut the process a bit with an aerator. An aerator is a device that you pour wine through. It's basically a funnel with a small hole in the side that draws in air as the wine swirls down. This serves two purposes -- it's a "fast swirl" to get the alcohol evaporating and the air injected into the wine opens the wine more quickly. Traditionalists will say that this can "bruise" the wine -- and it might not be a good idea for really expensive vintages. To get your ordinary table wine up to speed, it works pretty well. I've had good luck with the Respirer Next Generation model . I won't delve too deeply into the arcana of home décor, since wine glasses and decanters come in all shapes and sizes to serve your every need, but I can mention one particularly interesting addition to the wine world -- the breathable wine glass. These glasses, produced by Eisch , allow oxygen to penetrate the glass itself, thus bringing the entire surface of the wine in contact with air rather than just the top. As a result, the wine opens much more quickly. It really does work, and they're dishwasher safe. My only caution about these glasses -- you can't keep a glass of wine in one of these for too long. After a couple of hours, the wine can go flavorless. I don't think that will be a problem for any of our readers, though. If you don't finish a bottle for some reason and you want to keep it for an extra day or so, I think a vacuum stopper, coupled with putting the bottle in the fridge overnight (and letting it warm back up) is better than the old "jam the cork back in and hope" method. Again, Vacu Vin's Wine Saver Pump is my go-to. Their basic vacuum and stopper set has served me well. As a final recommendation, here's an indispensible invention for anyone who drinks a lot of red wine. Red wine picks its spots to spill -- usually on the lightest colored upholstery, carpet, or clothing that you've got in your place. The pigments in red wine, called anthocyanins, attach themselves to any kind of fabric and cling like a nymphomaniacal gymnast. There are plenty of home remedies, the best of which is to dump a bunch of salt on the stain and hope for the best. However, I heartily endorse a more commercial solution to the problem: Wine Away Red Wine Stain Remover . The inventor of this stuff has earned my eternal gratitude. I was doing a wine tasting about a year ago, and I spilled red wine on the hostesses' cream-colored carpet. A few squirts of this stuff -- the stain comes up like magic. Get some. You'll thank me later. After eight years together, the Sweet Partner in Crime and I tied the knot last night. Under the watchful eye of the Reverend Christine the Pie Queen (who just returned from safari), we declared our intent, exchanged our vows, popped open a good bottle of bubbly (Domaine Belluard Mont Blanc “Brut Zero” Savoie, for the record) and headed off for a wonderful dinner at Nectar. Last Friday, we made our first (long-overdue) visit to Water Tower Fine Wines, a new store in Mt. Washington owned and operated by David and Jan Lazarus. David and Jan have been friends of the Vine since our successful Sunday Salon in February 2008. David's one of the most knowledgeable folks I've ever met about all things oenological, and he told me on multiple occasions over the last couple of years that he's always wanted to run his own wine store. The store is a converted, rambling house initially built in the 1890's and built onto over the years. It still has a "homey" layout (several adjoining rooms and seating areas instead of aisles and queues, which gives the place a laid-back feel. Water Tower's selection is quite broad, although not as wide as many of the more "traditional" stores that you'll see around the area. This is by design. David is the person from whom I shamelessly cribbed "pop tart wines" as a descriptor of inexpensive, interchangeable, mass produced selection where one producer is very much like the other. (For instance, Funky Llama vs. Little Boomey vs. Yellow Tail.) Small differences, yes -- but pop tarts are pop tarts. You won't find those wines in this store. Most of the varieties in the store, both red and white start around $12-15 and run up into the hundreds. His zinfandel, pinot noir, and rosé ranges are especially impressive. A few varietals (such as some of the South Americans) have somewhat limited selections, but what's there is quality stuff. Water Tower has just about the broadest variety of sparkling wine -- considering price point, origin, and style -- as any store I've seen in the area. David also takes a great deal of pride and pleasure out of both helping people find wines that they're looking for and to take the opportunity to educate a bit. I'll readily admit that I've learned quite a bit from David. He's led me into temptation several times, but he's never led me astray. Every Friday, Water Tower hosts a wine tasting. They charge $15 for at least 6 tastes, with a couple of "premium pours" available for a few extra bucks. Plus, according to David, "We'll usually have a couple of other things open" for people to try. The charge also includes light hors d’oeuvres, put together by Jan -- who is an accomplished cook. She changes the menu each time to pair best with the week's selections. This week, to pair with their Marsanne, Roussane, and Zinfandel tasting, Jan offered up gourmet versions of chili mac and mac and cheese, as well as some toasted pate-spread flatbreads -- and some other usual wine noshables like cheese, Italian meats, and crackers. Yes, the SPinC and I ended up taking home a couple of wines from their tasting menu on Friday. We picked up the Early Bird "Syn" Cuvee Blanc ($19) -- a sparkling blend from Australia that's light, floral, and just plain ol' pleasant. This is, to my knowledge, the first white sparkling wine from Australia that we'd ever tried. (We'd had sparkling shiraz, however.) Instead of chardonnay, the traditional grape for Australian sparklers, this was a blend of Marsanne, Roussane, and Semillon. This paired well with almost everything, but I thought it was best with the flatbreads. We also got the Verget du Sud 2007 Vaucluse Marsanne, which is a wonderful value at $14. A creamy-yet-light white to enjoy just about any time of the day. Lots of soft citrus and minerally goodness there. This one, I thought, went incredibly well with the "mac & four-cheeses." The creaminess of each were nice complements. The chili mac went well with most of the reds -- the other wines were a couple of single-vineyard zinfandel selections from Ravenswood -- the Teldeschi ($35) & Belloni (on sale for $18) from 2006, and the premium, which was a Napa syrah from Kuleto ($46). Water Tower Fine Wines is located at 6316 Campus Lane in Mount Washington. Campus Lane is just off Beechmont. It's on the opposite side of Beechmont Avenue from the Mt. Washington Kroger. Basically, just look for the water tower. It's right across the street. Mike says check them out. Just in time for the holidays, tickets are now available for the 2010 Cincinnati International Wine Festival that will take place March 11 – 13, 2010 at the Duke Energy Convention Center (Grand Ballroom) in downtown Cincinnati. Grand Tasting tickets purchased in advance will range in price from $60 to $70, with a $5 increase if purchased at the door. Winery Dinner tickets will range from $125-$175 per ticket and Charity Auction & Luncheon tickets will remain $125 per ticket. Purchases can be made by logging onto our website, www.winefestival.com, or calling (513) 723-WINE. You may remember my tooth-stained coverage from last year. A few months ago, I took a look at Viognier, which I find to be one of the more interesting white wine varietals. Viognier is a notoriously tough grape to grow. One theory about the name of the grape is that because of low yields and susceptibility to mildew, "Viognier" is actually a modification of the Latin "via Gehennae" -- which means "road to hell." Modern winemaking techniques have improved the production of the varietal, but it's still relatively low on the global production totem pole. Viognier is beginning to be grown more widely -- the U.S., Argentina, and Australia being the largest producers outside of France. Since the grape's yield is low, high quality Viognier (and thus blends containing it) tend to be a little more expensive. Viognier is most well knows as a component in many of France's Rhone wines. In the northern Rhone, Viognier is largely grown as a single varietal or is used as a stabilizing agent for the color in Northern Rhone reds, which are almost always Syrah dominant. In the southern Rhone, Viognier is almost exclusively used as a blending grape in whites from there, usually as a complement to grapes such as Roussane, Marsanne, Clairette, and Grenache Blanc. For instance, the Domaine Mirelle & Vincent 2007 Cotes-du-Rhone ($13-15) is made all of the above except the Grenache -- and contains about 10% Viognier. It's a very well-balanced, minerally white with an interesting earthy flavor that makes it a nice pairing with any kind of roasted veggies or just to enjoy. In the previous Viognier column, I focused on tasting single varietal Viognier. Honestly, I'm not as much of a fan of "pure" Viognier as I am other varietals (although if I started regularly drinking Condrieu, a high end northern Rhone Viognier, I might change my mind...). I think it's a great companion grape. When properly blended, Viognier can contribute to the creation of some really interesting wines. At least for right now, the preponderance of these Viognier heavy blends seem to come out of Australia. The Ozzies love their blends, and they're also best known worldwide for Shiraz. It would logically follow that they'd try to experiment with the synergy that the French discovered. The blend is usually only with one other grape -- rather than the multi-grape mishmashes in the Rhone. When blended, Viognier tends to both tone down the juiciness of the traditional fruit bomb that can be Australian Shiraz. The intensely aromatic nature of Viognier also adds a forward floral nose of its own and deepens many of the existing flavors and scents of the red. It also adds a little acidity to the finish to balance the tannins. A couple of examples I've had lately are the Woop Woop "The Black Chook" 2006 Shiraz/Viognier ($15-18) and the d'Arenberg 2006 "The Laughing Magpie" Shiraz/Viognier ($20-25). The Black Chook ("Chook" is Australian for "chicken") is a big, full flavored wine that's excellent for drinking on its own some evening when you want a hearty red. It's fruit-forward and powerful without being cloyingly pop-tartish. There's a really interesting smoky flavor to it that makes it line up almost perfectly with dark chocolate. The Laughing Magpie is a little more nuanced, although it's certainly bold like the shiraz-dominant blend that it is. It's got a perfumey nose from the Viognier with a strong scent of blooming lilacs (which I personally love). There are flavors of plums and nectarines heading off in every drirection with a little bit of a chalky note. Finish is only a little fruity, but very long with soft tannin and a slight acidity that continues for well over a minute. I had this with marinated, grilled lamb chops and wilted spinach. With the lamb, the flavors brought out the herbs in the marinade I was using -- especially the rosemary and thyme. The minerally tone also let it work with the spinach, which can ordinarily be a real wine killer. On the white side of the fence, staying with our friends at d'Arenberg, I had their 2008 "The Hermit Crab" Adelaide Viognier/Marsanne. (Don't you love the names of Australian wines?) The Hermit Crab, so named because this is similar to the dominant blend in white Hermitage, wasn't as fragrant as I initially expected. Viognier and Marsanne are aromatic varietals, but their combination here is light, floral, and a little citrusy. It's fruitier than I expected as well with lots of apricot and ginger. It's not as dry as a lot of straight Viogniers, finishing up with a refreshing hint of sweet and some solid acidity. In general, flavorful, tasty, and great to drink on its own. It would also be a winner with some good spicy foods. $15. In the US, you'll typically see Viognier as a single varietal, although the "Rhone Rangers," a group of winemakers largely from the Central Coast region of California who focus on Rhone varietals, have also done some experiments with red blends that include Viognier. They tend to be fairly pricey, but when done well, they're absolutely dynamite. For instance, the Ridge 2005 Lytton Ridge Syrah fits the bill. It's around 80% syrah, but the 20% of makes this a fascinating blend. The nose is wonderful. The big, plummy scents are there as you'd expect, but so is an appley note along with the traditional Viognier floweriness. The body is medium on its face, but I think the viognier gives the wine length without it simply coating the inside of your mouth. The finish is full, tannic, and extremely tasty. It's around $28, but it's a really nice, showy wine if you need to impress. Seven Hills wines are also available across the country, so they're at least obtainable wherever you might be. I thought these wines were excellent values if you're looking for "good bottles" for just about any occasion -- especially the reds. Five Southern Ohio wineries have teamed up for the "Annual Ohio River Valley Barrel Tasting Tour." The winemakers at Harmony Hill Vineyards & Estate Winery (Bethel), Kinkead Ridge Estate Winery (Ripley), Burnet Ridge Winery (Cincinnati), Henke Winery (Cincinnati) and Woodstone Creek Winery (Cincinnati) will open their cellars to feature barrel sampling of unreleased vintages. Currently released award winning wines will also be available at the tasting counters for those interested in purchasing that special holiday gift. This is a very traditional event common in California and Oregon, for families and friends to tour their local wineries, taste current and upcoming releases and meet the winemakers. More information is available at www.KinkeadRidge.com/barreltasting.htm . Last year Cincinnati Magazine featured this event as a Top Pick for November. In the second annual Ohio-Michigan Wine Clash, a blind tasting event held in Ann Arbor and Michigan, Kinkead Ridge 2007 Cabernet Franc was the only Ohio wine in the top five. For the second consecutive year, Harmony Hill was selected for the 2009 Best of Bethel Award in the Wineries category by the U.S. Local Business Association. When you write a column like this one, it's easy to fall into a rut. Therefore, interspersed among my normal columns, I've decided to initiate the Alphabet Soup Project -- where I wander letter by letter...and see what we come up with. So, to begin: A is for...alternatives. I like to break out of the usual mold of around-the-house varietals from time to time just to see what else is out there, especially when it comes to Italian wines, since they grow so many varietals that aren't really seen commonly on this side of the Pond -- or really anywhere else, for that matter. Those crazy Italians grow something in the neighborhood of 500 varietals of grapes that can be pressed and fermented. I broke out of my normal Sangiovese/Montepulciano/Barbera-heavy rotation of Italian reds with the Di Majo Norante 2005 Contado Molise Aglianico. In case you didn't notice, the actual grape in that lengthy title is "Aglianico." Aglianico is a varietal largely cultivated in southern Italy. It's a high-tannin, high-acid wine that usually needs a few years in bottle before it's really drinkable. I'd read that this was an exceptional pairing for pasta puttanesca, so I made a version that included some broccoli and caramelized onions. Thought I don't think of broccoli as particularly wine-friendly, this was really nice. The high acidity made it perfect for an meal like this full of spices and cheese. The acidity worked well as a palate cleanser and to bring out the bright cherry fruit that this wine has to offer. It was a little lighter than many of these wines, being similar weight to many straight Chiantis, but with considerably more structure and without the bite many of them carry. It was right around $15. Along the same line, I wanted a drinkable Italian white for an afternoon and was looking for something pinot-grigio-ish. I landed on the Valdinera 2006 Roero Arneis. Arneis is a varietal grown in the Piedmont region, known most famously for Nebbiolo-based wines Barolo & Barbaresco and for Asti spumante. This fragrant medium-bodied white actually reminds me a great deal of Viognier. The nose is quite perfumey with plenty of melon and cider. It's medium bodied with a bit of an oily consistency that gives way to a nice amount of minerality. The finish is dry and slightly alkaline. By itself, nice enough to sip on -- but we opened on a Saturday afternoon where we'd put together a little "antipasti" for ourselves -- hard cheese, salami, and crackers -- it performed really nicely, with more fruit coming out as we worked through the food. Again, around $15. I can have this sort of fun in France, as well. I was under the impression that all white Burgundy is made from Chardonnay. I was wrong. Danny Gold threw me the Domaine Chêne 2007 Macôn-Villages -- which is made 100% from a varietal called Aligote. Aligote is planted largely in Eastern Europe, but also makes an appearance in a few white Burgundies. It's typically lighter and more acidic, and is the traditional base for the cocktail called kir. Unlike many Macon-Villages, which are some of the oakier whites in Burgundy, this one is a crisp quaffer. The nose is lemons and minerals. It's a bit slow to start, flavorwise, but a little time and warmth reveal pleasant melon and lemon waiting for you. The finish is slightly tart and quite flinty. The minerality made it a nice pairing with spinach salad. Spinach has that chalky texture which makes it a notorious wine-killer. This wine mellowed the chalkiness, but had enough character not to get swallowed by the mushrooms and bacon. Interesting, and solid value from $12-15. When I'm considering a wine pairing, the first thing I think about are what the major flavor characteristic are of a particular food. In this case, peanut butter would give you creamy and salty. What are the complementary flavor types. Creamy would point you towards white wine, since the acidity helps cleans your palate. Salty -- well, I don't know about you, but I like sweet with my salty. What's the traditional peanut butter partner? Fruit jelly! So, a white wine with some sweetness in it to counterbalance and complement those flavors -- the first thing that jumps to my mind is Riesling -- especially a somewhat sweeter Riesling. You'd probably be OK with most domestic ones that aren't labeled "Dry Riesling." German Rieslings tend to be a little more nuanced, and you'd probably lose that with your basic peanut butter sandwich. That's my recommendation. Other ideas from out there? I joined a group last week at a (sports - of course) bar where multiple screens were showing Blues Hockey, Cardinals Baseball, Mizzou Football, and even though people roll their eyes about the Rams, they're still the home team, by gum! As I perused the menu and thought about which elixir would go down best, I felt very uncomfortable even implying (with discernible hesitation and accompanying raised eyebrows) I might throw beer and wings to the wind and satiate my lust for the vine. The confused group looked at me as if I had six heads. Additionally, the added peer pressure made it difficult to order a nice pairing with confidence. What's a wine gal to do? Could you suggest strategies for making quick and confident selections of food/wine based on the traditional watering hole menu? There are usually more wines than just the "house", but I don't want to merely partake alone in my corner; I want to inspire. Disclaimer: I am not referring to "bars" like Friday's, Applebee's, Chili's, or other apostrophe'd chain restaurants that are ostensibly watering holes. These zits on the face of most American suburbs offer broader food options and "wine lists," but they're the gastronomic equivalent of a bachelor/bachelorette party -- sure, you can make a ruckus with your friends and you'll probably end up buzzed and full, but you'll wonder what happened to your evening, your wallet, and your sense of self-respect afterwards. Most bars, pubs, taverns, etc. offer some kind of hot (as opposed to haute) cuisine. The menu usually consists of various forms of absorptive, high sodium items usually created for sharing, scarfing, and grazing unthinkingly while your focus is elsewhere. These selections, as Lee pointed out above, usually cry for beer -- often for cheap, light lager-ish beer. Why is that? Well, let's think about that. We're not talking craft brews here -- those are usually better appreciated on their own. Your typical lagers that you'll find at a bar are usually served ice cold, so you can't taste much. They're watery, which washes the salt out of your mouth. (Which is, after all, the point of salty bar food -- keeps you drinking!) Thanks to the hops, they're also mildly acidic, which counteracts the heat caused by the bases you find in your average jalapeno popper. Beer's your most flexible choice -- but we want wine here. OK, first off, as with most nights you're going out, start by lowering your expectations. You've got to be realistic. Most bar owners aren't interested in keeping a well-stocked wine cellar. They're often thinking, "Red, check. White, check. Pink, check. OK, on to the Jagerbomb makings..." Thankfully, as wine's popularity permeated the mainstream "going out" crowd, bars began stocking something other than Sutter Home White Zinfandel to feed a particular stereotype. So, what should you expect? Uncomplicated wines (read: "California or Australian") are the order of the day, so you don't have to worry about screwing up a pairing. You can almost always bet on three wines for sure: a cabernet sauvignon of some kind; a chardonnay (which will probably be the "house white"); and a white zinfandel. Merlot's not uncommon, and there's usually a pinot grigio lying around somewhere. Riesling is becoming more common -- usually the sweet versions, and places trying to be classy might have a pinot noir. Rule #1: Bubbly. I've said it over and over again -- the best wine pairing with the salty, fatty foods that you're likely to find in any of these establishments is going to be a sparkling wine. Many bars don't carry it, but if you're lucky enough to be in a place that does, go with it. It doesn't matter what kind -- dry works just as well as sweet for this purpose. Swallow your pride and some Asti Spumante. So what if people look at you crosswise for drinking bubbly in a bar? If there are enough sporting events on, you can always say that you're celebrating something. And before long...you probably will be! Rule #2: When in doubt, white. This may sound somewhat emasculating to men who have a strange aversion to wine that's not big, powerful, and dark -- but get over it. If you want a good flavor, this is generally going to be the way to go. Wines that are tannic or high in alcohol don't generally play well with foods that are high in salt. Salt and tannic wine combine to taste "hot" and a bit unpleasant. White wine has a couple of other things going for it, too. The higher acidity makes for a more flexible food pairing. Acidic wines like pinot grigio will either quiet spices or go more easily with flavors. Also, as anyone who's ever eaten French fries with ketchup or chocolate covered pretzels can attest, sweet and salty make a delightful combination. Inexpensive white wine often has a little bit of sweetness, because a little bit of sugar covers up a whole lot of poor winemaking. Use this to your advantage. Actually, while white zin gets a particularly bad rap for being sweet, bubbleheaded plonk -- the very thing that makes it palatable to people who "don't like wine" make it particularly good with your typical bar menu. It's sweet and tart -- so it'll work with just about anything. However, if you go that route, tell everyone that it's actually a dry rosé so you can maintain a modicum of dignity. After my foray with Maryhill Winery, I jealously read K2's "Washington Wine road trip." The state's been pretty good to me lately, so I thought I might as well take a little closer look at the place, especially since a broader variety keep showing up in the wine stores around and about. On the world wine stage, Washington's a relative newcomer. Not long after settlers started moving to the Pacific Northwest in great numbers in the late 1880's...along came Prohibition to throw a big ol' monkey wrench into the works. Once the Dark Ages were over, Washington started producing some wines -- but most of them were of the sweet, jug variety. "Actual" wine production really got moving in the 60's and 70's, and some of the more recognizable labels (Columbia Winery, Chateau St. Michele) started showing up. Washington wines were largely a curiosity nationwide until the merlot boom of the 1990's. Washington's soil and cooler climate were perfect, it turned out, for cranking out large quantities of relatively inexpensive, approachable merlot. This gave the state a real foothold in the American market and it's been solid ever since. My image of the Pacific Northwest didn’t exactly match up with "perfect grape growing environment." When I think of Washington, I think of snow-capped mountains, gorgeous rivers, Pearl Jam, and lots of rain. Grapes like to grow in dry soil -- and dry is not the first thing most people think of regarding Washington climate. What kind of amphibious grapes are they growing out there? The answer lies, as it usually does, in geography.All but one of the viticultural (WineSpeak for "wine grape growing") regions lie to the east of the Cascade Mountains. While western Washington is very wet, the Cascades form enough of a tall, solid wall that the clouds end up dropping all their moisture on the west side of the mountains, leaving the eastern side extremely arid, but with irrigation water available. Couple this with sandy, volcanic soil, and you've got a dreamy place for a vinifera grape vine to drop roots. You'll see a lot of similar varietals from both California and Washington. If you try them side-by-side, though, you'll probably notice a pretty sharp difference. Especially among the reds, Washington wines tend to be "softer" wines. Cooler climates allow grapes to ripen more slowly. The fruit and tannin tend to be more subtle. I've rarely run into a fruit bomby merlot from Washington, especially among inexpensive ones -- whereas if you try a merlot from California at the same price point, you'll get a big, fat dark berry in the face. A nice example I found lately was the Dusted Valley 2006 "Boomtown" Merlot. At first sip, I noted how much lighter this wine tasted. It also started off almost tart, so I decanted it, and the flavors balanced pretty well. The tartness eases a bit as some air gets to it. The nose is raspberryish and tasty. The flavor isn't overly fruity, sliding more towards an easy smokiness. By itself, I thought it was OK -- but we put next to a somewhat complicated-spice meal and it performed beautifully. On the menu: roasted pork chops in a Moroccan (read: nutmeg, ginger, and cinnamon-heavy) spice blend, sautéed pears in a sauce of apricots, onions, honey, and more of that spice blend. The spices, being largely bases, cut the tartness in the wine -- allowing more of the cherry and berry fruit character to show through -- and it smoothed out the spices as well. This one was around $15 for a spice-friendly, light meat answering wine. Washington also produces a fair number of other Bordeaux-type grapes. Cabernet Sauvignon is fairly common, and Bordeaux blends of Cabernet and Merlot are easy to find. I popped open a Washington blend and found some interesting iterations. The Kiona 2003 Cabernet/Merlot was a fascinating blend, especially for $9. The wine had an interesting "French funk" on the nose that I would not have expected. The body had some muted fruit and earthiness that could easily have passed for a young Bordeaux. The finish was slightly fruity, and definitely a major value if you're into some more Francophilic selections. This one also demonstrates the aging potential of some of those wines -- since it's held up flawlessly for six years in a low price point. Among whites, Washington is known widely for some very good Rieslings and Gewurztraminers. They're made in a wide variety of styles, and I've tried a couple of examples lately. The other day, I had the Chateau St. Michele Cold Creek Vineyard 2006 Riesling -- CSM is one of the best-known Washington wineries and, along with Hogue, always produces a bottle that I know I can count on. I've thought their regular Riesling is always a little too sweet and slightly sharp, but this "single vineyard" version still comes in at around $13 and is a significant improvement. It's got a slightly "oily" nose with plenty of apple and melon scents. The body is very smooth. It's nicely balanced -- it reminds me a lot of a German Kabinett. The fruit holds firm and doesn't get lost in some of the sharpness that some Rieslings have on the end. The finish is soft and pleasant. It was an absolutely exceptional pairing with a potato, leek, and fennel soup topped with smoked salmon. I also cracked the Barnard Griffin 2008 Columbia Valley Riesling. Quite a contrast. It's very light for a Riesling -- almost Chardonnayish in feel-- with a flint and lemon nose. The flavor was very crisp and minerally. Some tasty green apples at first, but it mellows a little to a creamy lemon. The citrusy finish is a little tingly, almost like there's a little spice or carbonation. Good acidity. There are few Rieslings I'd consider "refreshing," but this one fills that bill. It also matched up well with a chicken & chickpea curry. Washington wines, for me, have always been good, reliable choices. Many of my "go to" inexpensive bottles have been from there -- and as I'm trying more wines from there, I'm realizing just how much depth this region has. The winemakers up there do experiment quite a bit, so I'm looking forward to seeing what the next "big thing" from there will be. When I attended the Cincinnati International Wine Festival, I noted that Maryhill Wineries in Goldendale, Washington, was one of the labels with which I was the most intrigued. While my palate was somewhat blunted by the cacophony of flavors that I'd been working with that day, I found myself really drawn to Maryhill. They were priced right, seemed tasty and straightforward, and were easy to quaff. They grow a broad variety of grapes, which can sometimes give pause, but they manage to keep the quality fairly consistent. Most of their wines are in the $10-20 range, which makes them quite attractive. Since the festival, Maryhill's done pretty well for itself. They were recently named the 2009 Washington Winery of the Year by Wine Press Northwest. Their production has expanded greatly over the last few years, and their wines are becoming much more available. Maryhill Winery 2008 Viognier -- We were putting together a salad of our garden veggies, some grilled chicken, and a balsamic vinaigrette and hadn't opened a wine for it yet. I took a shot in the dark here, and it paid off. The nose of this wine is less floral than many viogniers, nosing more of light wood and minerals than of flowers. The flavor is a medium bodied mix of pear and pineapple with a touch of the traditional viognier oiliness. Vanilla dominated the finish. Quite tasty. The salad had a number of strong flavors -- citrus, smoke from the grilled chicken, fresh lemon basil, earth from mushrooms, and this wine stood right up next to it all. It didn't overwhelm the salad's flavors, but it didn't turn either insipid or astringent. A great wine to pair with the salad. The longer the wine sat, the more pronounced the smokiness and vanilla became. I'd really consider letting this sit open for a half hour before diving in. We confirmed the pair's quality at the end when the SPinC reached for the bottle and said, "Hey...well...this sure didn't last long...." One of the highlights and a steal at $15. Maryhill Winery 2006 Proprietor's Reserve Malbec -- We cracked this on a night where we'd both had a long week and wanted to put together a nice meal. We'd watched a few episodes of some old Julia Child shows from Netflix and we decided to try our hand at some green beans and stuffed mushrooms. For a main course, we marinated up a London broil in some vinaigrette and lime juice and tossed it on the grill. Grilled food & Malbec. We figured we couldn't lose. Nice nose of vanilla and dark fruit. I might have mistaken it for a good Merlot. Nice smooth, balanced fruit on the palate that slides easily towards a finish full of vanilla, pepper, and coffee. It's a very balanced Malbec without some of the really harsh tannins that some of them can have. It's also not quite as spicy, so if that's what you're focusing on, that's probably not going to ring a bell for you. But if you're looking for more of a balanced flavor, it's nice. I get the sense, also, that this is somewhat of an "experimental," limited production wine. It's about $30, so I might wait a couple of years on this one, unless you want to lay it up for a few years, which could prove interesting. Maryhill Winery 2006 "Winemaker's Red" -- The Maryhill "Bordeaux Blend with a twist" is their most popular wine. It's a blend of Cabernet Sauvignon, Cabernet Franc, and Merlot, with the "twist" being some Syrah thrown in for good measure. It's got an interestingly plummy, funky nose -- very earthy for a wine from the Northwest. Like a Bordeaux, it's lighter on the palate than many of the California meritages, so they've got the body right. The finish is where the wine was a tad disappointing. Initially, the finish seemed a little watery, smoky and clipped. After some serious swirling (and drinking about half a glass), some coffee notes come forth and the balance improves. Not the most complicated wine, but very drinkable. I wonder what it would be like with another year in bottle. A decent value at $14. Maryhill Winery 2006 Proprietor's Reserve Cabernet Sauvignon -- The few cabs that I've had from the Pacific Northwest have tended to be mellow, "drink me now" concoctions. The cooler climate tends to make more subtle wines. Maryhill's Cab is certainly subtle, but it carries a little muscle with it. It's not as powerful as many of the California versions, but it is a full wine just the same. The nose simply wasn't there at first, but after an hour of breathing and quite a bit of swirling, I got rewarded with a very smooth, licorice and berry nose. The palate is fruity once the wine opens. At first, it's a wall of tannin, but the fruit does emerge. Once it does, lots of dark fruit and coffee. The finish is long and a bit heavy on the tannin. With the steak we had for dinner, though, that tannin was a bonus -- allowing the wine's fruit to show up and balance the meat, the mushrooms, and even the wilted spinach. With the mandatory chocolate and cabernet pairing, we were a bit underwhelmed. It was good -- but the flavors didn't quite marry. The reserve is $36. (Their "normal" cab is $20.) Would be a good one to grab a few bottles of and stick in the cellar for 3-4 years. Once the tannins have calmed, this'll be a rock star. To sum up, with the exception of the pinot gris, I'd recommend most of these. (Warm weather whites like pinot gris generally don't do as well in the Northwest, in my experience.) The price is right for most of them and they've all got some depth for wines at these price points. If you can find these in your local store, give them a go. I’m going to relive the Phoenix’s recent wine dinner -- not just so you all get to hear about how perfectly cooked the lamb was, how fresh the vegetables tasted, or what absolutely splendid pairings got rolled out for us during the course of the evening. I hadn’t had the opportunity to try that many Burgundies at once (there were six -- three red and three white) to get a sense of the variations in flavor and style. The experience was reminiscent of this May at the Vintner Select anniversary celebration when I had the chance to plow through flights of Barolo and Barbaresco. I’ll share my observations, but I’ll back up a bit and give a little background on the region first. Reds are made from Pinot Noir. Whites are made from Chardonnay. That’s all you need to know to start. The Burgundy region can be roughly divided into three parts. The northern part is known as the Côte d’Or, home of many of the highest quality Burgundies. The Côte d’Or is also subdivided into two regions – Côte de Nuits and Côte de Beaune. The former is known best for reds and the latter for whites, although each region produces both. The middle third of the region is made up of the Côte Chalonnaise and Maconnais regions. This part produces many of the more inexpensive wines in Burgundy, including many that I’ve written about in other columns. Maconnais, especially, cranks out a huge percentage of the white table wine from Burgundy. The bottom third is the Beaujolais region, which is a whole other animal, making the light reds I referred to above. If you want to know more about those wines, go here. About 60 miles northwest of the Côte d’Or, is the Chablis region, known (of course) for whites. Chablis, much like Burgundy, has a negative connotation in the minds of many, as these names were bastardized and stolen by California winemakers in the 70's, who cranked out jug after jug of plonk. The chardonnays produced in Chablis, France are...shall we say...a bit tastier. There’s a classification system for wines in Burgundy, based on the quality of the terroir from which the grapes originate. This differs from the individual chateau classification in Bordeaux, which doesn’t follow regional terroir differences, in general. The classifications run, in descending order: Grand Cru (named by vineyard -- can cost in the thousands per bottle); Premier Cru (sometimes written “1er cru” – and named by vineyard and village); Village (named by…well…village); Subregional (from a slightly larger area – like Macon-Villages) and Regional (simply called “Bourgogne”). Chablis has its own measures of quality, but are still termed Grand Cru, Premier Cru, and Village. There’s also a “Petit Chablis” designation, which roughly relates to subregional. The wines we had, as you'll see later, were mostly village level, with one regional and one 1er cru thrown in. To dinner...The Phoenix is a beautifully designed former gentleman's club built in downtown Cincinnati in 1893. (Think scotch & cigars, not pasties & poles.) The Phoenix is now largely a banquet and reception center, but manager of 19 years Kent Vandersall has a fairly steady stream of special events, wine dinners, and the like in the restaurant. If you haven't seen the interior of this place, it's worth the price of admission to one of these events just to have a look. It's quite remarkable, both from an architectural perspective and from the "Wow!" factor. Kent runs a tight operation. The service was exceptional and he made us, as first-time guests, feel quite welcome. Until recently, their wines have not been widely marketed in the States, but according to Ed Hernandez, their domestic marketing manager (who we had the pleasure of swapping stories with during dinner), this is about to change markedly. Reception: Chanson Vire-Clesse 2006 ($18-27/bottle retail) -- Kicked off the evening with...not a bang, exactly, but certainly an appetite-whetting aperitif. Vire-Clesse is a town in the Maconnais, near Pouilly-Fuisse. I loved the nose on this wine. In my experience, chardonnays aren't usually quite this floral, and I thought it smelled of strawberries. The flavor was very crisp and lightly acidic, but with a nice spice and structure. An excellent palate preparation. First Course: Honey Lime Shrimp, Capellini w/Chanson Chablis 2007 ($20-30)-- A classic example of good Chablis. Plenty of minerality and acidity, floral and citrus scents, and a long, crisp finish that absolutely screams for pairing with something light like shellfish. The shrimp and capellini that we had with it was actually one of our favorite courses. The flavors were very delicate, and they married wonderfully with the wine's citrus. Second Course: Arctic Char with White Beans, Mushrooms, and Dried Tomatoes w/Chanson Meursault 2006 ($45-60) -- My inexperience with white Burgundy had me unprepared for this wine. This wine had an incredible amount of strength and depth for a white. I was interested to hear from Sophie that Chanson ages their wines in older casks, so as not to overoak and obscure the flavors of the grapes. In this case, what they created was an incredibly complex, melony, slightly smoky wine that was full-bodied without feeling overly heavy. Paired up with a fish that's a cross between trout and salmon and those earthier vegetables, the wine stood up nicely and was able to handle the oil in the fish, which was prepared to perfection. Delightful. Third Course: Rosemary Dijon Lamb Chops with Swiss Chard w/Chanson Bourgogne Pinot Noir 2006 -- This wine was the first of the reds. This is a regional-level wine, made from select grapes grown all across the Côte d'Or. It was a very "refreshing" red wine. Quite fruit forward, but with some very nice spice on the back end that made it very interesting. On its own, an excellent wine, but with the tiny lamb chops seasoned and roasted to a pinnacle of flavor, it made a wonderful compliment for the fairly delicate but numerous flavors of the lamb. In my opinion, as this is such an incredibly flexible wine, this was probably the best value of the night at $18-22 a bottle. Fourth Course: Veal Marengo, Creamed Whipped Parsnips w/Chanson Beaune Clos des Mouches 1er Cru 2006 -- The showstopper. I tasted this wine and my eyes literally rolled back in my head. I'd never tasted a pinot noir this good, and I've tasted very few wines of this quality, period. (I can only imagine the state in which a grand cru might have left me. Descriptions might violate some blue laws.) Powerful, yet delicate, this wine wrapped my palate in layer after layer of smoke, spices, cherries, and other flavors that I couldn't even identify. Incredible balance. But tasting notes don't do this wine justice. The world got quiet when I tasted this wine. Alas, this was the one food pairing of the evening that didn't quite work for me. The richness of the veal stew that it was paired with overwhelmed all of the delicate flavor in the wine. I ended up drinking less than half the glass and putting the rest aside for later. The SPinC did not, but managed to sweet talk her way into another glass so she could do a side-by-side with the next course. This wine is only starting to become available in the states, and will set you back around $90. And yes, I bought a bottle to lay up for awhile. Even at this price, it was irresistible. It's apparently fine to age for 20-25 years, so this joins the "target date" wines in our cellar. Fifth Course: Filet of Beef, Carrots Parisienne, Pinot Noir Demi w/Chanson Gevrey-Chambertin 2005 ($40-60) -- Of the grand cru pinot noir vineyards in the Côte d'Or, 24 of the 25 are in the Côte de Nuits. Tasting this back to back with the Clos des Mouches gave me a wonderful sense of the difference between the wines from the two parts of the Côte d'Or. The Côte de Beaune reds, as I learned, are traditionally much more delicate than the Côte de Nuits. The Gevrey-Chambertin was a lovely illustration of the power of the Côte de Nuits. This was a much more powerful wine. Lots of licorice and vanilla on the flavors, and a much deeper level of fruit, along with a great deal of tannin for a pinot noir. It's understandable why this wine would be set up next to a filet. I think this was the first time I'd had a pinot paired with a steak, and this one certainly had the heft to make a side dish, especially with the fabulous demiglace drizzled across the filet and carrots. While I preferred that pairing, the SPinC actually preferred the Clos des Mouches. Since the filet was roasted instead of grilled, she thought that the meat was delicate and light (or as delicate and light as beef can be) enough to stand up to the filet. Sixth course: Fruit and Truffles. Exactly what it sounds like. Handmade chocolate yummies and some berries to nosh on while we finished the last of our wonderful wine, chatted a bit more, and eventually made our way out with smiles on our faces. For the record, the Gevrey-Chambertin went much better with the chocolate and dark fruits. I'd definitely recommend checking out some of the special events at the Phoenix if you're looking for a good way to spend an evening. Many thanks to Ed, Sophie, and Stacey Meyer from Heidelberg Distributing for organizing the meal, to Kent for a wonderfully designed meal to complement these wonderful wines, and to the winemakers at Chanson for a slice of bliss.